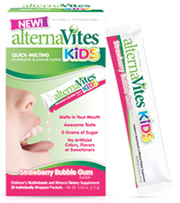 Features: AlternaVites Kids, with 17 vitamins and minerals, are sugar-free powder crystals that melt in your mouth. They come in two kid-friendly flavors and can be poured straight into your mouth or mixed into yogurts, puddings or smoothies or sprinkled on top of fruit. 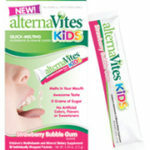 AlternaVites are an excellent alternative to chalky chewables or gummies that are high in sugar, low in nutrients and can stick to their teeth. For children ages 4 and up. Green Factor: AlternaVites Kids does not contain artificial sweeteners, colors, preservatives or flavors. Made from ingredients that are not derived from animals or animal by-products. Bonus: Made in the USA. Free of the major food allergens (egg, fish, milk, soy, peanut, shellfish, tree nut, or wheat) and certified Kosher. They also make an adult version of AlternaVites that are excellent for people who have difficulty swallowing pills. Discount: Enter ‘moms20’ at checkout at www.alternaVites.com to receive 20% off your order. Editors Note: My kids LOVE AlternaVites!